This week has been a tough one. I've been sick since Sunday and it just won't quit. I wake up in the morning feeling like maybe today is the day I'll be back to normal but it just hasn't happened. It's been a good reminder that I need to take better care of myself overall. More time for exercise, paying attention to what goes in my body, and making sure there is enough 'me' time scheduled each and every day for some mental relaxation. Luckily, it's been a beautiful week. The sun has been shining and the sky is a bright blue. Thanks to the warm and soothing sunshine, I've been able to spend time with my little guy outside where I can sit in a comfortable chair and watch him as he plays. It's been a bubble-blowing week over here. Right at this very moment, Riley is taking sips of water from his cup and spitting it on the grass saying, "I want ta grow deez!" I do too, buddy. I do too. I may not be feeling well but that certainly doesn't mean I'm going to deprive you of a cocktail post the weekend of St. Paddy's Day. That would be wrong for so many reasons. I decided to take Vietnamese coffee- one of my very favorite things- and give it a little Irish twist with a shot of whiskey. Nothing wrong with that, right? Is it spring where you are? You trying to "grow deez"? If you haven't taken a few minutes to sit in the warm rays of the springtime sun, I encourage you to do that right now. Get your face all up in that warm glow and soak in some vitamin D. It works wonders. Begin by spooning the coffee into the top of a Vietnamese metal coffee filter. In the bottom of a heat proof glass, pour the 2 tablespoons sweetened condensed milk. Set the filter on top of the glass and pour boiling water over the coffee grounds until the water almost reaches the top. Let the coffee drip through the filter on top of the sweetened condensed milk. Set the filter aside carefully- it will be hot! Stir the coffee until it is blended with the milk. Fill a glass with ice (some of it will melt so fill it extra full). 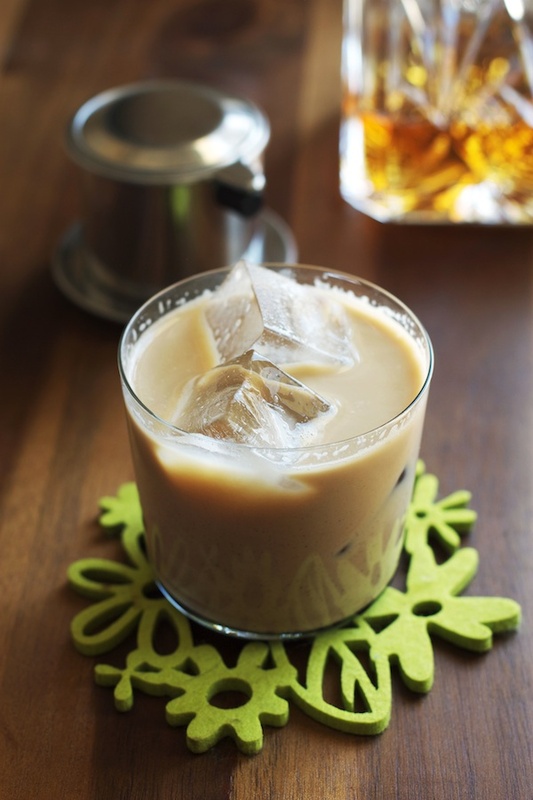 Pour the whiskey over the ice followed by the coffee. Stir to combine.